Key defends Murray McCully Prime Minister John Key has defended his Foreign Affairs Minister, saying although Murray McCully is not missing in action, he has "absolutely no clue" where he is. 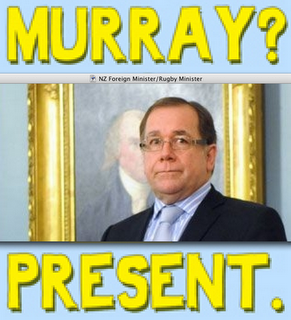 Murray McCully is in hiding right when he is gutting MFAT, how convenient. Almost as convenient as all the emails released by this supposed Russian Cyber Criminal group who use NZ time coded computers all being glowing in their praise for Murray McCully? Isn't it amazing that this Russian Cyber Criminal group have no idea of tactics (why give your nationality away in your name 'The Comrades') or how to change a timecode, yet have enough local knowledge to get into contact with Patrick Gower who will breathlessly do all the smoke screening while MFat gets gutted? Isn't it amazing how each email they release justifies all the cuts Murray is making? And John Key has no idea where he is? Isn't Murray really the leaker? The word farce doesn't even begin to sum this up.